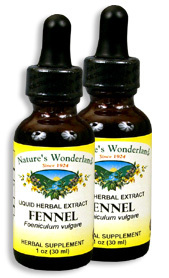 Fennel Extract, 1 fl oz / 30 ml each (Nature's Wonderland) - Penn Herb Co. Ltd. The aromatic Fennel seeds are tried-and-true, effective support for superior digestive & gastrointestinal health. They alleviate gas, bloating, fullness, upset stomach, as well as soothe occasional heartburn and acid indigestion. But Fennel is more than just a digestive and stomach soother! The seeds are a traditional weight-loss aid that helps curb appetite (sip a cup of the anise-flavored tea to help accelerate digestion of fatty, starchy meals too). On the go? Feel better with our fast-acting liquid! AMOUNT PER SERVING (333mg/ml or 30 drops): Fennel Seed (Foeniculum vulgare). OTHER INGREDIENTS: Grain Alcohol (50-60% by volume), Deionized Water. Free of: milk, dairy, egg, fish, shellfish, tree nuts, peanuts, wheat, gluten or soy. Promotes healthy digestion; relieves stomach ache; alleviates gas, bloating, fullness; calms abdominal cramps; soothes occasional heartburn and acid indigestion; helps maintain gastrointestinal health; supports bronchial & upper respiratory health. Promotes healthy lactation; helps curb the appetite; relieves menstrual cramps; included in laxative blends to reduce intestinal cramps.